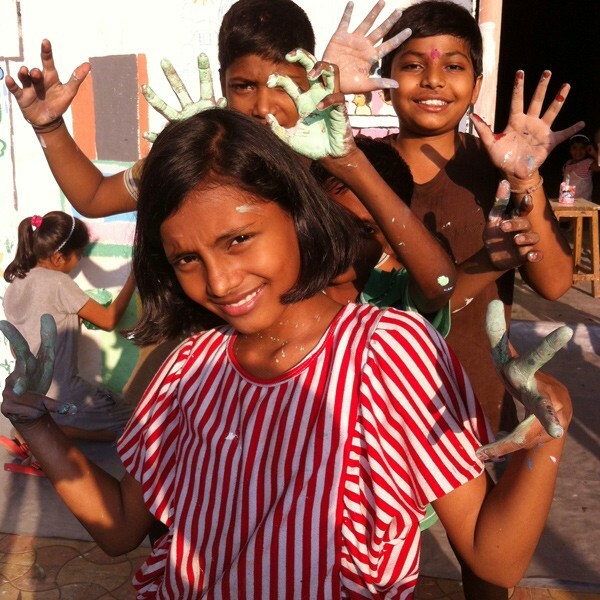 An art workshop with the children of the Maharashtra Seva Housing Society, Shastri Nagar, Dharavi, Mumbai, India, 19-24th October 2014. Real experience tends to surpass any preconceptions or expectations we may have. Everything happened very fast the moment I arrived in Mumbai. I was assisted by Shyam Kanle, of URBZ, as well as by my friend Rohit Gandhi. From day one I had to think on my feet. 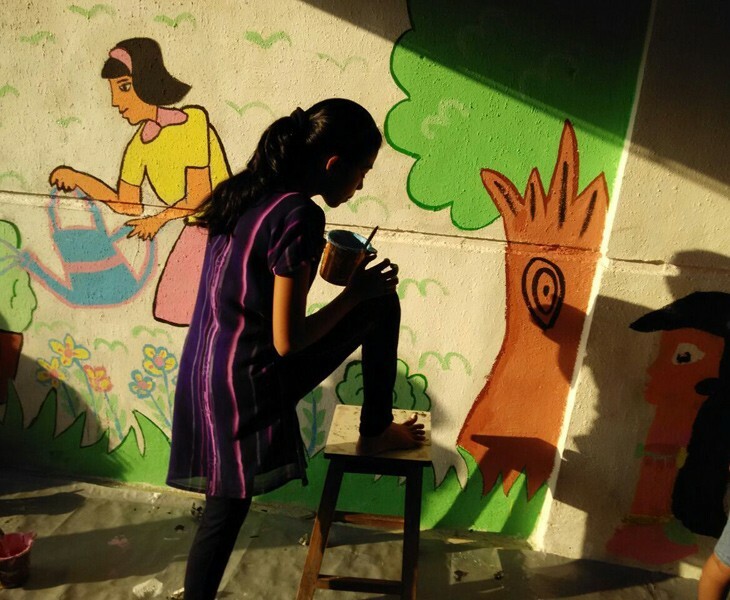 After assessing the workshop venue – the community building of the Maharashtra Seva Housing Society on the fringe of Dharavi – I decided to divide the 5-day art workshop into two parts: one, to paint a series of murals on the bare exterior walls of the Housing Society and two, to paint on recycled material. Initially I had a group of fifteen children between age eight and thirteen but that group grew organically to involve younger and older siblings of the participants, including some parents and teachers of the children. I was surprised, as I didn’t really need Shyam to translate much because most of the children spoke excellent English. I organized the children into groups asked them to brainstorm and sketch out ideas they had concerning their immediate environment. 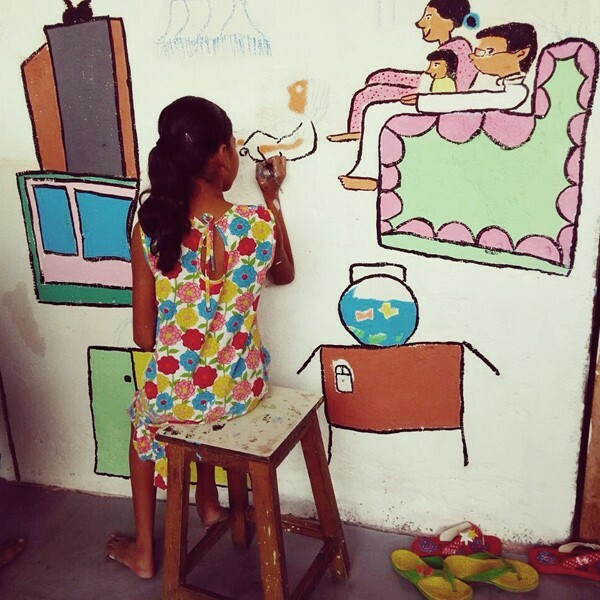 Once we had the composition put together, the children went off in their teams to prime the exterior walls white and proceeded to transfer their designs onto the walls with chalk, and paint their designated sections. 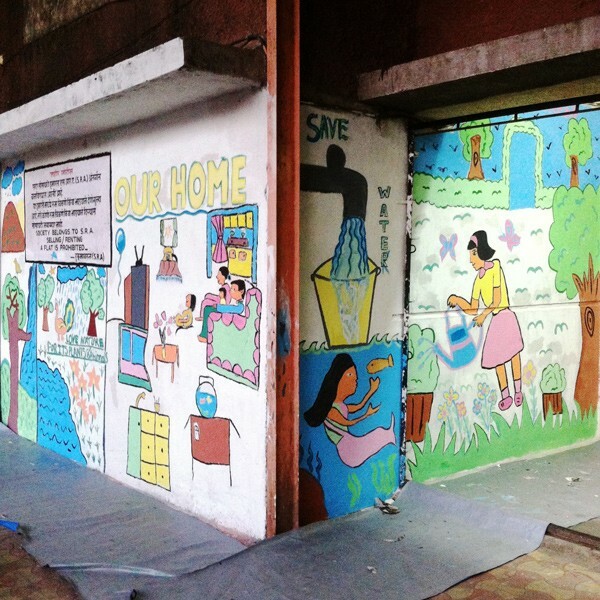 Within three days we had the main front exterior wall of the building, the interior walls of the entrance corridor, as well as a wall in the courtyard covered in beautiful images designed by the children. What struck me was that the children needed so little guidance. The designs carried a message and were full of wit: “Save Water”, “Love Nature and its Animals”, “Be a Star Fish, be a gold fish, but don’t be selfish”. They were extremely independent thinkers, very competitive amongst each other and all had strong opinions. 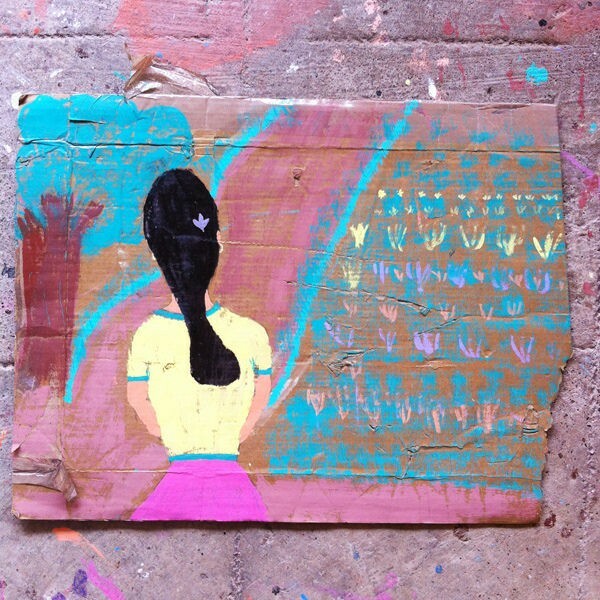 On Day 4, I launched the second part of the project: painting on found and recycled material. The kids were quick to find used cardboard from boxes as well as chipboard and discarded wood to work on. 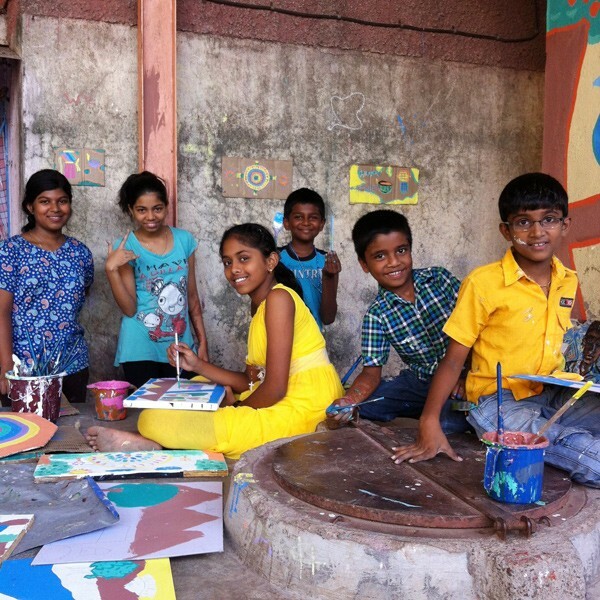 The children voted to use the theme of “Diwali” – the festival of Lights – as motif for the cardboard paintings since the workshop was taking place exactly in Diwali week! This was a great opportunity for me to get to know some local culture. 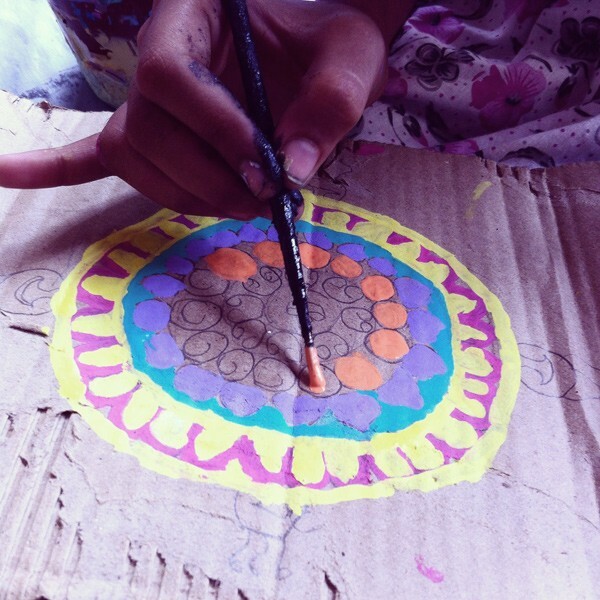 Thee were proud to teach me about Rangolis, those beautiful geometric compositions made especially during Diwali week. 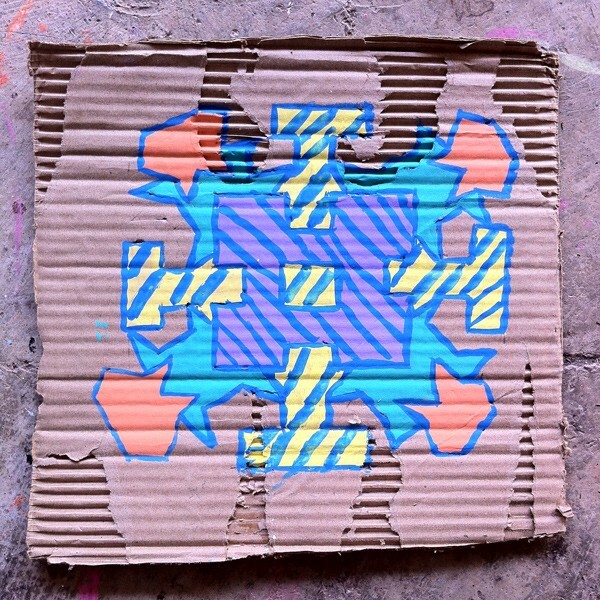 I encouraged the kids to pay careful attention to the material qualities of the cardboard and to experiment with textures. The results were, again, pretty amazing, and the colored paint stood out wonderfully from the brown card. The children had great autonomy throughout the entire project, so when it came to painting on the wood, they themselves decided to try out painting landscapes. 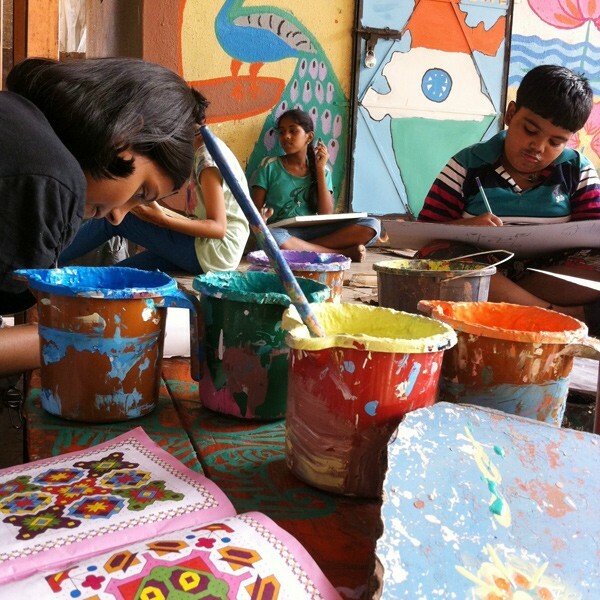 On the last official day of the workshop, the children finished off their paintings on recycled material. I tried out different ways of displaying the works, and ended up attaching the cardboards to the courtyard walls. 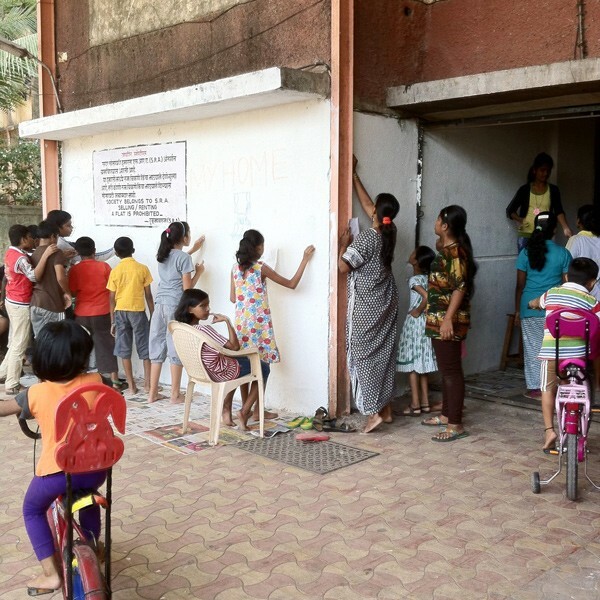 This method, albeit temporary, gave the entire housing community a chance to view the children’s output. 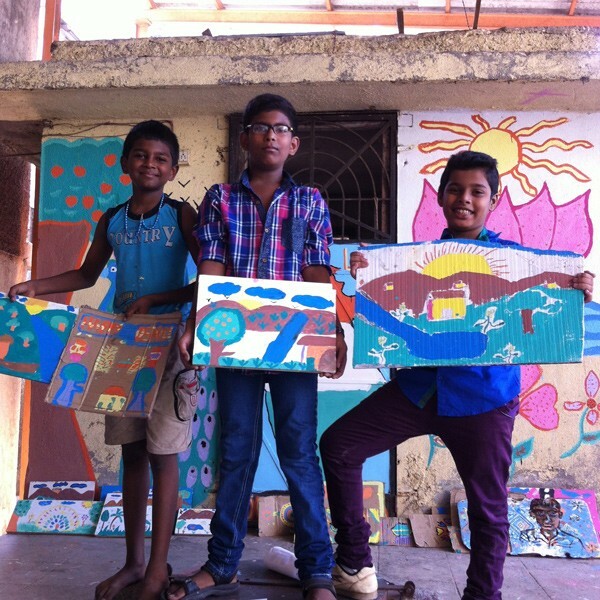 I wish I had had some more time to properly organize the final art works by the children into an exhibition at a formal gallery and/or at a more public site in Dharavi so that a larger audience would be able to view the works. I did speak to the parents of the participants and brainstormed ideas such as displaying the works on the community grounds, inviting the public in and trying to sell the pieces so that the children would take pride in their creations. The children and their families had really grown on me over the course of the five, six days we spent together. I was overall overwhelmed by the generosity I was greeted with. The children had been amazing students and had shared their enthusiasm, energy, and imagination with me. The families had shown their appreciation towards me by welcoming me into their houses and daily lives. Each day of the workshop I was invited by a different family for lunch and was able to taste real home cooked delicacies and listen to their stories. Their care went so far as to prepare a little dinner box for me to take home with me each night! On the eve of Diwali, one family dressed me in a wonderful Saree and gave it to me as a gift to take home. I didn’t have much time to produce any of my own work, apart from a quick sample sketch for the children on found wood, and a sketch on a door. But leaving my own physical mark had not been the priority in this project. My real concern was to leave behind a trace that goes beyond the merely physical: What I hope is that I left a mark that remains in the young hearts and minds of the children, as well their families; a memory that will continue and encourage them to express themselves through visual form in their immediate environments. 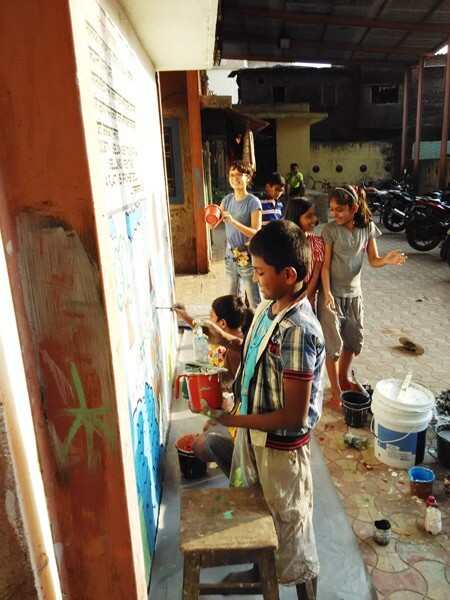 My experience in Dharavi shocked me in the sense that, more than any other place I have visited, it made obvious to me the essential gap between pre-conceived / pre-fabricated ideas of a place, and the actual lived reality of it. 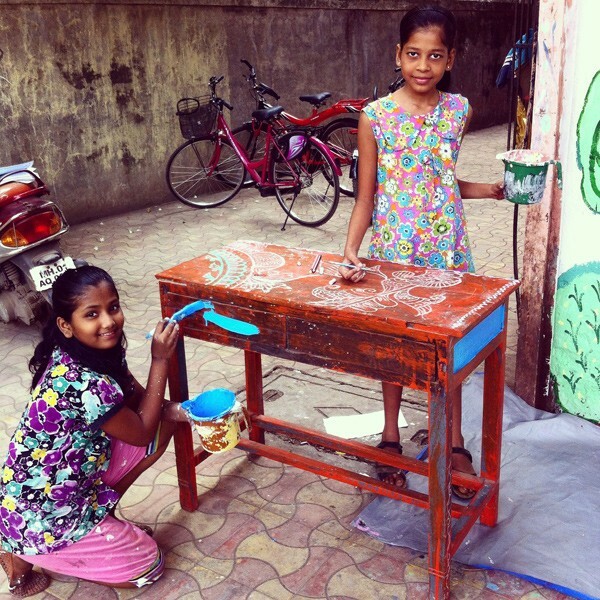 I was surprised by the feeling of heterogeneity I gathered of Dharavi as a “slum”. I had been to slums before in Manila, the Philippines, and to be honest, those realities were much starker and depressing than what I experienced in Dharavi. Despite obvious sewage and garbage problems, the parts I had seen of Dharavi seemed to me very functional and organized, compared to I imagined before my arrival. The apartments of the Maharashtra Seva Housing Society especially were spacious; each had a kitchen, bedroom and clean toilets. What the Housing Society building did lack in my sense was an identity. This I feel has changed now with the wonderful murals by the children: suddenly those bare and gloomy walls have an expression. I also felt that the Housing society functioned as a community in itself, and its inhabitants were clear to differentiate “insiders” and “outsiders” to me. I found this conscious “border-marking” interesting. The peoples living in the society were of different faiths – Christian, Hindu– and came from different regions. I wondered how they all ended up in one building. The complexity of what I have experienced in Dharavi has made me curious and I am keen to do some serious research into the topic of urbanology, the formation of slums as a narrative, its links to “development” schemes as well the impact climate change has on these dynamics. Moreover, I want to research on how I can formally situate and frame my art practice within these processes and develop and inform future community projects with my findings. GRIT in MUMBAI….to be continued. 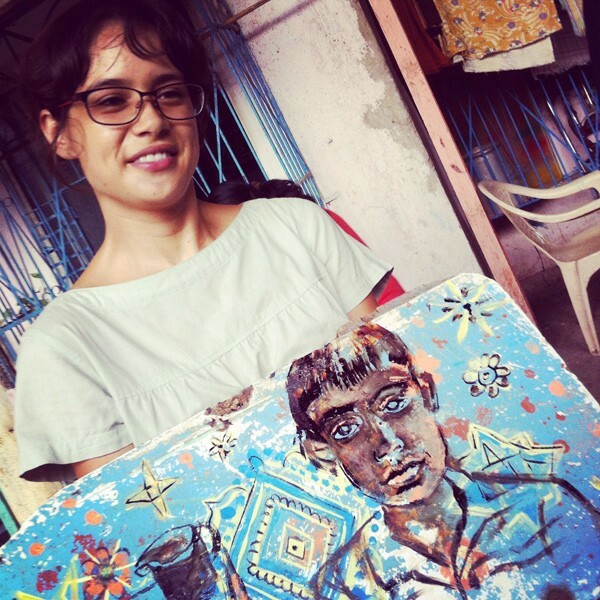 Melanie Gritzka del Villar is a Bangkok based artist.